Grab a lounger or hop on in for a refreshing dip. Bring your racquet for a few games or a casual rally. Enjoy family meals and family game night. Gather 'round for a family cookout. Head to the snack bar for espresso drinks and pastries. You're right across the street from the Ala Wai Golf Course. Aston at the Waikiki Banyan is conveniently located just one block away from Kuhio Beach. Once you get settled in your condo, change into swimsuits, grab water wings and goggles and remember, there’s no such thing as too much sunscreen. Go for a swim in the outdoor pool or lounge with the latest issue of People magazine and catch up on your celebrity gossip. When the kids get hungry, take advantage of the bbq grills and have a family cookout. Let your little helpers carry hot dogs, burgers and sides. Then lay out condiments and toppings and let everyone go to town. If you like tennis, bring your racquet and take on the competition on the on-site courts or keep the ball in play with a friendly rally. If basketball is more your style, get in touch with your inner-Michael Jordan on the basketball court. Get your caffeine fix at Banyan Breeze, the on-site coffee shop. One-bedroom condos sleep five guests. Full kitchens because sometimes a mini-fridge just doesn’t cut it. Check out the on-site convenience store and snack bar or for more variety the nearby Food Pantry Grocery Store. The kids will be begging to help make your famous chocolate-chip cookies (and be the official taste testers). And freezers are perfect for storing dessert – popsicles for the kids (and Häagen-Dazs stash for the grown-ups). Don’t worry if things get crazy; there are coin-operated laundry facilities at the resort. When it comes to in-suite entertainment, Aston at the Waikiki Banyan doesn’t mess around. Catch a sitcom rerun on the Flatscreen TV; it has Cable. Challenge the kids to a game on the In-Suite Playstation 3 (which doubles as a Blu-Ray player). Keep it low-key and have a family movie night. Bring favorite movies from home or check out the movies available for rent at the resort. Pop some popcorn and call everyone into the living room. Last one on the couch is a rotten egg! You’re surrounded by great restaurants from the upscale Sansei Seafood to the casual LuLu’s Waikiki. Check out Kuhio Beach’s calm swimming area; it’s protected by a sea wall. Surprise the kids with a visit to the Honolulu Zoo. The forty-two-acre zoo features several animals including lions, zebras, warthogs, Koloa Maoli (Hawaiian duck), a two-toed sloth and Komodo dragons. Any golfers in your party? Good news! 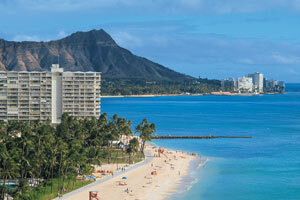 Aston at the Waikiki Banyan is just a short drive to Ala Wai Golf. This 18-hole course opened in 1931 and was designed by Donald MacKay. While the golf lovers are occupied, gather the shopaholics in your crew and head to Waikiki Beach Walk for a little retail therapy. Blue Ginger features resort wear in original designs; Island Sole has a variety of flip-flops from brands like Sanuk, Toms, Hurley and Soles. Need a new swimsuit? Sunshine Swimwear has over forty-eight brands of swimsuits to choose from. Check out Hi Life for apparel with the “spirit of Aloha.” Hungry? Ruth’s Chris Steakhouse, Cheeseburger Beachwalk and Yard House are just a few of your options. Be sure to stop by Honolulu Cookie Company for dessert.